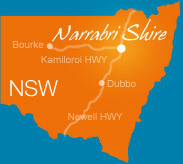 Narrabri Shire and Cleanaway are now working together to provide residents with their waste services. Council provides various waste services across the Narrabri Shire area which can include recycling, organics, garbage and bulky household goods collections. If you have any queries in relation to your waste services please contact the waste hotline on 1300 736 719. Residents eligible for a service will receive 3 garbage bins. Residents have the option of a 140L or 240L sized garbage bin. Any waste that is not hazardous can be placed in your garbage bin. However residents should endeavour to minimise the amount of waste put into the garbage bin by recycling whenever possible. Residents have the option of a 240L or 360L sized recycling bin. Narrabri Shire encourages the recycling of empty steel cans, aerosol and aluminium cans, plastic bottles and containers, milk and juice cartons, glass bottles and jars, paper and cardboard. It is vital for the recycling process that only the correct items go into the recycling bin. Incorrect items can cause many problems in processing and may result in recoverable resources going to landfill. It is essential that recyclable items are not placed in plastic bags. Plastic bags can do damage to the machines that sort the recyclables. The green bin is for the collection of suitable garden and food waste. Residents should use this service as much as possible when disposing of their small tree prunings, flowers, weeds and grass clippings at home. Residents can also dispose of thin branches up to 1 metre long. Your property will receive two bulk household collection services per year on prescheduled dates. You can present 2 cubic metres at each collection (ie 2 metres x 1 metre x 1 metre). Residents will be notified in advance when these collection dates will be and will be required to book a collection.